This Nov. 20, 2017, file photo shows a customer at a coffee bar in front of an Amazon pop-up store inside the Lakeview Whole Foods Market store in Chicago. 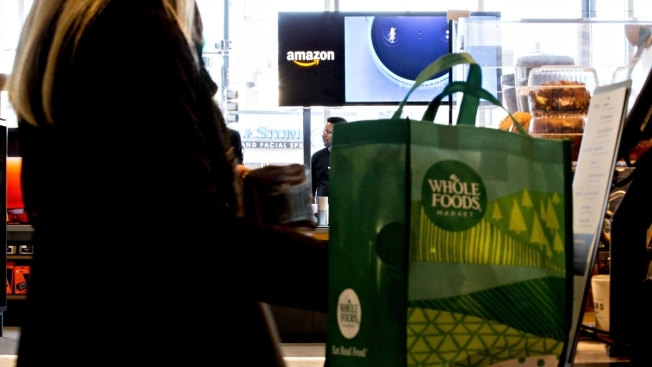 Amazon is bringing its Prime membership to Whole Foods, giving members special discounts and deals at the organic grocer. This week in Florida, for example, Prime members can get $2 off a pound of organic strawberries or save $10 a pound on wild halibut steaks. Amazon wouldn't say if it plans to add the benefits to Whole Foods stores in Canada and the United Kingdom. Amazon said last month that it had more than 100 million paid Prime members worldwide. That was before it announced it's raising the price to $119 a year, up from $99. Prime members get fast shipping from Amazon.com and other perks, like access to its video streaming service. To show that they're Prime members, shoppers can scan the Whole Foods app at the register or give the cashier their phone number.